Note: We haven’t had horses at Clucky Dickens Farm for a few years. Because of that, I had taken this post off my site. But since nothing actually ever leaves the internet, I often get emails from folks asking where the article is. Pinterest and backlinks from other sites prove it once existed. 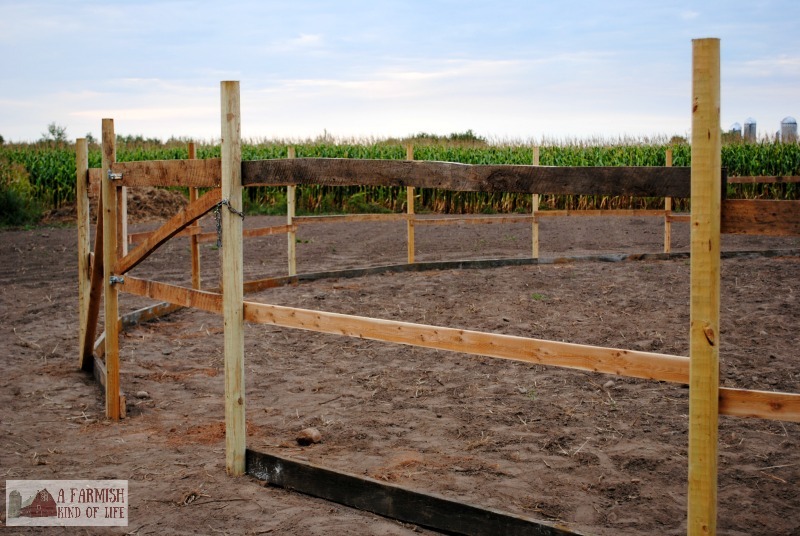 So I once again present to you our post on how to build a round pen for cheap with the caveat that we no longer have horses, and the round pen has since been taken down. However, it worked great when we still had our horses! I, however, immediately imagined lots of dollar signs flying from our bank account. Fifty bucks? Are you kidding me? 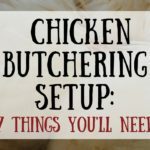 How to you build a round pen for $50? It was $50 for the 8 foot landscaping timbers used as vertical posts (when we built this in 2012). The rest of the stuff we used was salvaged from around the farm from projects we’d already completed, or things we’d taken apart and saved materials from. 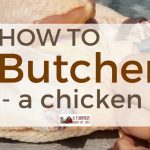 Reusing and re-purposing is the name of the game when you’re a homesteader, and that’s the surest way you’re going to build a round pen for cheap. As far as measurements on this round pen, I can’t help you there. We no longer have horses and the round pen is no longer standing—that space now has apple trees and a patch of clover. I do remember that we wanted the round pen to be a certain size. We marked the center and stood there, measuring out so many feet from center around in a circular shape until we’d marked out the perimeter of the round pen. We dug holes with a post hole digger and then set the posts into the ground 18 inches or so. We did not have to use concrete in the holes, but you certainly can if you’d like. After setting the landscape timbers in the ground and making sure they were level—not leaning one way or the other—we screwed 2x6s (8ft long) to the posts around the bottom perimeter. 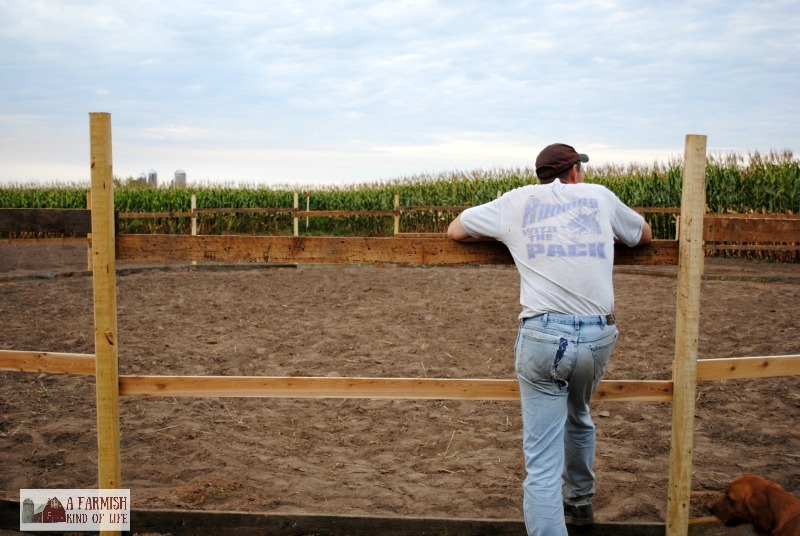 This supported the structure, and also helped keep the sand in the round pen. We then screwed 1x4s (8 ft long) to the posts around the middle perimeter, off setting them at every other post — one set of 1x4s high, then the next set lower. Next we had to build a gate. We also added a landscape timber diagonally to the left of the gate—it provided additional oomph to support the weight from the gate on the vertical post it was hinged to. The gate was built simply: two hinges on a rectangular frame with one diagonal board across the middle to keep it from shifting. The latch was a piece of chain that could be wrapped around both the gate and the vertical post next to it and then secured with a hook. Because, yo. Using what we had. …which is really the point of this round pen. We used what we had access to. Use this round pen to spark ideas for how you can build your own. 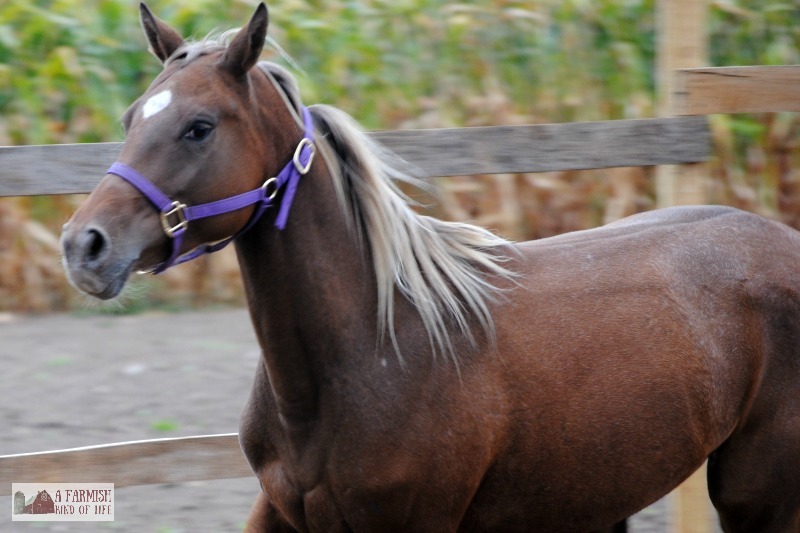 Remember, your round pen can be whatever size you want it to be, and the size will mostly likely be determined by what kind of training you’re planning to do within it. I have no measurements from the one we built. ** Remember, these costs are only approximate and will probably be different depending on where you buy your lumber locally. 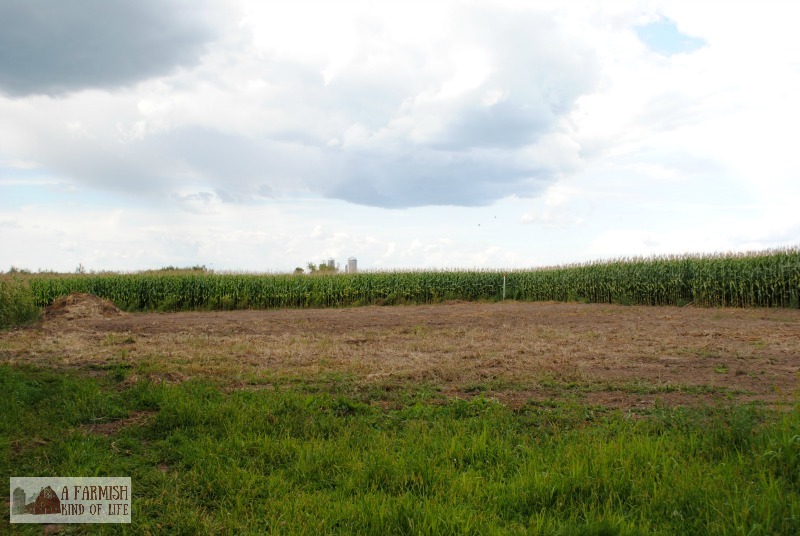 All in all, the round pen served our purposes for the time that we needed it. We never had a horse escape or jump out or bust through the sides. It looked good, it didn’t break the bank, and it worked! 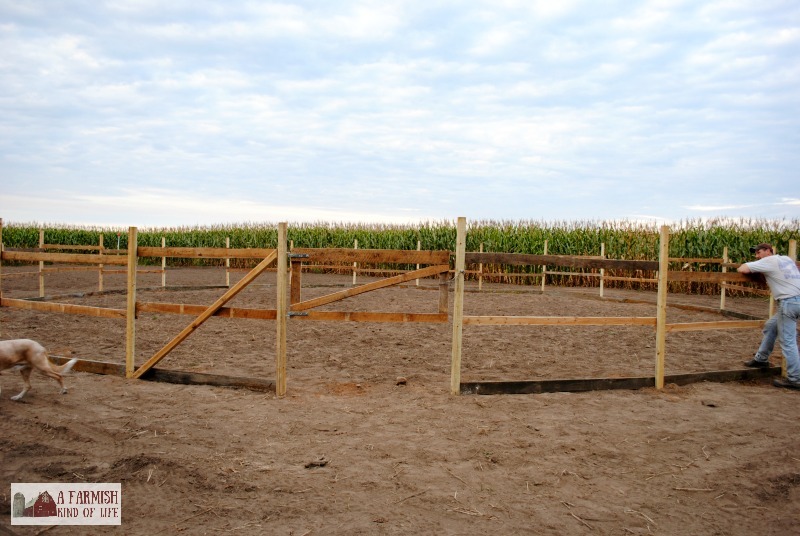 If you build a round pen, either similar to this design or different, be sure to tell us about it in the comments! Great pen! To be used for the horses? Looks as though you all could have used a hosing off before getting your showers! I think you did very well to have only spent $50 for the materials. Hey there! Been a long time since I dropped in and I can't believe the changes! Wow! You guys have been working your tails off! I have to work on catching up. Your hubbs is sure talented! Great recycling project. I bet the horses will be quite pleased as well. Looks great and $50?–what a deal! O.M.G. I HATE YOU! I mean, wow, what a lucky gal you are! What a wonderful (and frugal) beautifully made round pen. I am so happy for you and your horses (I hateyouhateyouhateyou). Although I do have to admit I may be a wee-bit jealous. That is a good looking pen! When I was a kid we lived on a dairy. We got a horse (saved him from the glue factory my grandpa said) and he was built a pen from reclaimed wood around the farm. The only problem? Someone forgot to remove ALL the old nails from the reclaimed wood. I found the forgotten nail. With my left hand. Right in the palm. In the nice meaty part just above the center of my wrist. Still have the scar 26 years later. I can still remember the blood curdling scream I let loose that day. The weird thing was that there was this big hole and no blood. You were thinking when you came up with that idea! Outstanding! The pen is awesome! I totally thought the same thing before I read your caption of Iggy's photo, looks like a Depression Era photo… but I guess our country is sort of going that way again, yeesh! FME leaning against the fence is the perfect male picture. Every man (and woman) needs a good fence for some serious thinking time. Works for day dreams as well. Old Uncle Bill would reply when asked, "What'cha been up to?" "The fence." He knew what they were really for. Impressive pen for $50. And your sunset picture at the top of the blog is breathtaking! AWSOME round pen on the cheap ! Now I see how I can finally afford one too. Just a thought . . . I hope you will think about putting a top rail on top of those posts . . . I sure would hate to see a panicked horse turn or rear and come down on one of the timbers impaling his/her neck or chest. Been there, seen that. Thanks for the tip ! great looking pen and the cheapest idea I have seen yet. Questions: Are the posts dug or just using the rails and bottom board as braces? What are the lengths of the sections and height (length between the post and height of post). Thanks so much for posting this! Looks awesome, i am looking for ideas for a round pen on the cheap, this is fantastic. I am hoping to sort one out soon.. thank you so much for sharing. what did you put down for the surface? what about drains etc? that would definitely cost more than £50 but on my farm, it would be essential. The surface is sand, and I’m not sure what you mean by drains. Here in Minnesota, I’ve never heard of an outdoor round pen having a drain. Perhaps we’re talking about two different things? I made my round yard free.. stacking up used tyres. The tyre place is happy to give them to you and some will even pay you to take them.. young horse dont hurt themselves on the rubber. Like they can with timber or steel yards.. iv never had an injury to the yound horses i break in.. i filled the tyres with the dirt that was dug out from the dam to make them more stable..
How sturdy are the landscape timbers? How far apart did you place the timbers? Looks like a great idea. My brother has an old barn we could use lumber from. It worked well for us and was sturdy enough for what we needed. We didn’t have anyone try to escape though. 😉 It stayed up until we took it down several years ago (because we sold our horses). Because it’s not up anymore, I can’t tell you how far apart the timbers were. Sorry!